Labor has blasted Scott Morrison, suggesting he played a role in leaking a confidential police submission to parliament’s intelligence committee, an accusation the prime minister attempted to brush off as a “grubby smear”. With the major parties trading blows about the Coalition’s bill to give security agencies access to encrypted communications, but also negotiating behind the scenes in an effort to land an outcome, Labor used question time on Monday to up the ante with the prime minister. Morrison was asked whether he could guarantee that neither he or his office played any role in the leaking of a confidential AFP submission referenced in an article in the Australian newspaper, with the opposition pointing out that unauthorised disclosure was a criminal offence. The AFP later confirmed it had made a supplementary submission to the parliamentary committee on intelligence and security on 29 November. It said “the submission was not operationally sensitive or security classified” but did not address the issue of confidentiality. Liberal Party MPs have held an unscheduled meeting to pass changes that would make it harder to get rid of a sitting leader. Prime Minister Scott Morrison introduced a new threshold to trigger a Liberal leadership change, requiring two-thirds of the partyroom vote to trigger a spill motion. The Liberal Party previously had no set method and no party room constitution dictating this. Mr Morrison said the change to party rules reflects an acknowledgement that the party's "own conduct of this period of time needs to be changed". One Liberal source told the ABC the move was designed to make it harder to dislodge Mr Morrison as Liberal leader after the election. A Liberal MP said the move was in response to feedback from marginal seat holders. The Labor party already has rules to prevent leadership spills. A minimum of 60 per cent of the Labor caucus must vote to remove a leader if the party is in Opposition. To remove a Labor prime minister, 75 per cent of the caucus vote is needed. Labor and the Coalition have come to an in-principle agreement on the government’s bill to give law enforcement agencies access to encrypted communication. 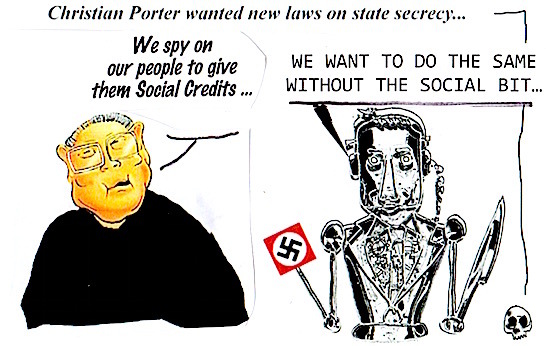 In a deal between the attorney general, Christian Porter, and his shadow, Mark Dreyfus, the government has agreed to limit the powers to investigation of “serious offences” and add new safeguards to agencies’ ability to demand tech companies build backdoors into their products. The deal paves the way for the telecommunications assistance and access bill to pass parliament in the final parliamentary sitting week, despite a breakdown in bipartisanship on Friday when the home affairs minister, Peter Dutton, blamed Labor for failing to support the bill.